One of the charms of Bangkok is that it’s really what you make out of it. When you go to New York, you have to visit Times Square at least once, when you go to Berlin, you have to walk through the Brandenburg Gate at least once, when you visit Paris, you simply can’t miss the Eiffel tower. And when you go to Bangkok, you have to… um… well, Bangkok doesn’t really have must-see places. Bangkok is more like the Elephant from that ancient Indian story with the six blind man. There once was a mighty king who wanted to teach some quarreling ministers a lesson. He called six blind men to his court and led them to an elephant, without telling them what it was. Then he told each of the blind men to describe the animal. Depending upon which part of Bangkok you see, you might have very different experiences. Thailand is the country with the highest percentage of Buddhist people – and religion plays an important role in the everyday life of Thai people. That is why you can find many temples in Bangkok. 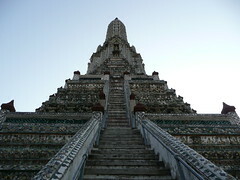 This is the most important temple for Thailand, and it features the most important Buddha statue, the Emerald Buddha. You can also see beautiful wall paintings that tell the story of Thailand’s national epic, the Ramakien. 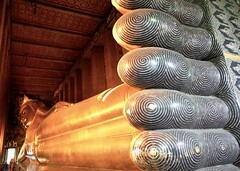 Here you can see the huge Reclining Buddha statue and get an authentic traditional Thai massage on the temple compounds. This temple is just across the river from the Wat Pho temple. You can climb the steep stairs here up and enjoy the view over the river. Best to come in the early morning hours, avoid during lunchtime because then it can be very hot. 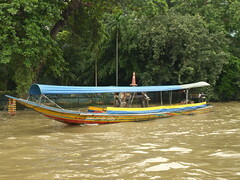 In the past, Bangkok was called “the Venice of the East”, because transportation happened mostly on waterways. Nowadays, most of these waterways have been turned into roads for cars – but in some areas, you can still see the old way of living by water. You can charter a long-tail boat at the Tha Tien boats pier, nearly the Wat Pho temple, and go on a 60 or 90 minute khlong tour. This will give you an impression of how live in Bangkok used to be. You can see many old wooden houses built on the river, children playing in the water, more green nature and a very nice atmosphere. 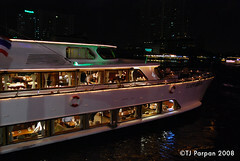 The Chao Phraya is a large river that runs through Bangkok. There is a boat that goes up and down the river, and for around 1 US-Dollar you can get on the boat and do a little sightseeing tour from the river. The boat is full of people, and sometimes you have to stand, but it is a very cheap way to get to see Bangkok by the river. If you want something more fancy, there are many nice dinner cruises. Especially fun if you travel with friends, and can be romantic when you want to have dinner with your partner. Price is around 1000 Baht (around 33 US-Dollar) per person. 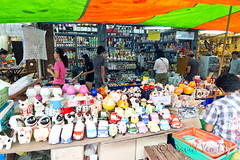 Bangkok is a great place for shopping, particularly if you are looking for handicrafts, silk, jewelry, gold, gems and fashion. There is nothing particularly “Thai” about these shopping malls – if anything, they are testimony to the globalized world we live in. But if you want to tickle your credit cards in the air-conditioned shopping bubble, Siam Square is perfect. 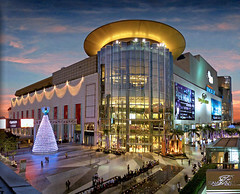 Siam Paragon is the newest and most impressive shopping mall in the area, right next to Siam Discovery, Siam Center and the more ecclectic MBK shopping mall (cheap shirts, fake “brand name” phones. The Chatuchak market is open only on Saturday and Sunday between 10AM-5PM, and it’s the biggest weekend market of the world with 8000+ stalls. If you are looking for souvenirs, home decor, handicrafts, furniture, indipendent designer shirts, antiques (fake and real), this is a good place. Always crowded, always busy, it’s an amazing place – if you are you with the fact that it is very hot and crowded here. Bangkok is the city of food – and honestly, it’s great not just for Thai food, but since this is a blog post about Bangkok must-sees, we’ll stick to talking about Thai food. Some of the best meals you can enjoy in the streets of Bangkok, rather than the restaurants, for about a tenth of the price. Particularly in Chinatown in the evening – around 6pm, the whole area basically turns into a huge food bazaar. 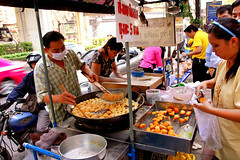 Bangkok has many great restaurants, and we’ll focus on the restaurants serving Thai food here. Taling Pling at Silom is a good place to start if you are not familiar with Thai food – not very spicy, but still quite authentic, and the prices are pretty fair. Soul Food Mahankorn is a great place run by a former good critic that fell in love with Thai food and opened his own Thai restaurant here. Awesome Thai food, great cocktails, hip music in a relaxed and friendly atmosphere, good prices. If you want to go fancy – Nahm restaurant at the Metropolitan is run by David Thompson, who opened the Nahm London (the first Thai restaurant ever to get a Michellin star). 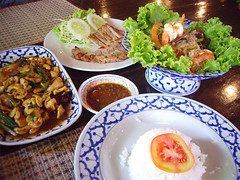 The Nara Erawan is a popular upscale Thai-food place, and if you come for lunch make sure to make a reservation before. 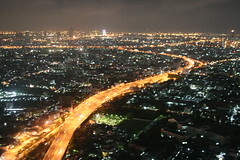 This is really nice at the end of your Bangkok trip – a way to say “goodbye” to the city. It’s best to arrive here around 20 minutes before sunset, so you get to see the beautiful change of colors and how the city lights up at night. 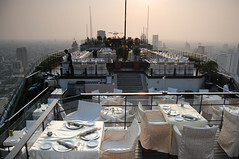 A fancy dinner experience and great cocktails can be had on the rooftop of the Lebua State Tower. They have a great open air rooftop bar with nice cocktails and fruit shakes here, with some relaxing jazz tunes in the background. The view is just as amazing as at the Lebua State Tower, and the feeling is more “in the air” – it’s kind of like being on a huge ship that hovers in the sky. There are many things you can do in Bangkok – these are just some of the general highlights. If you are interested in any particular topic, just post a comment below. Particularly the restaurants are just an “introductory selection” for first timers in Bangkok. They’re not the best, but they’re good places to get started, serve consistent quality, and you’ll be able to discover a lot more from there on. If you want a personal tour guide for your Bangkok trip, just contact us – it’s a great way to get to know the city with a friendly local by your side. And finally: Thank you Ideth for giving us the inspiration to this collection of must sees in Bangkok!